"I have stolen princesses back from sleeping barrow kings. I burned down the city of Trebon. I have spent the night with Felurian and left with both my sanity and my life. I was expelled from the University at a younger age than most people are allowed in. I tread paths by moonlight that others fear to speak of during day. I have talked to Gods, loved women, and written songs that make the minstrels weep. My name is Kvothe. You may have heard of me." The story starts out in a wayside inn, but it’s soon obvious that its owner is no ordinary innkeeper. Kvothe is a multilayered, complex character, and there is a big difference between the older Kvothe of the frame narrative and the younger, more idealistic and passionate Kvothe of the unfolding story – his biography of sorts, if you will. I loved reading about how he grew up with a troupe of travelling folk and how his acting and music remained such a big part of him even after tragedy struck early in his life. His growth and his struggle made me immerse himself completely in the story and after a somewhat slower start, I just couldn’t stop reading anymore. When I said that this novel is a masterpiece of storytelling, I meant that a large part of this story is made up of other stories. It’s not just one story, it’s a whole web of stories that I think will eventually have a connection to one another. And it’s not just the content of the stories, it’s the way they’re told. The setting, the voice, the feeling that you are given a glimpse of something ancient and amazing. The tension between ‘before’ and ‘after’. I enjoyed the concept and rules of the magic in this series immensely. The world building was revealed gradually and I loved learning about it alongside Kvothe. There is no info-dumping and you have to piece quite a lot of things together on your own. The depth of it, the languages, the places, the sense of a past, elevated it to the likes of The Lord of the Rings for me. That is not a comparison I make lightly. The University, where Kvothe eventually goes to study, was an amazing setting of old buildings, quirky characters, friends, enemies, and adventures. And, of course, eventually also some romance. I’m going to let you explore that place when you get there but let’s just say that it was my favorite part of the story. Kvothe has an remarkable mind and while he’s older than his years in some ways, he was very inexperienced in other areas and that made for an interesting balance. The greatest strength of the novel by far is the writing. It felt very fresh and somehow familiar in at the same time. It reminded me of the stories I used to read in my early teens. Rothfuss really is a gifted wordsmith and that’s what really brought the world and characters to life for me and made me care about what happened to them. He can write beauty and he can write despair in a way that is honest and heartfelt and brought tears to my eyes more than once. When he describes the sound of music, you hear it and it touches your heart. When he weaves a visual description, you see the world with new eyes. When someone hurts, you ache for them. So, in case you still haven’t realized: if you don’t own this book, run the next book store and buy it immediately. Read it. Let it whisk you away to a different world, go breathe in the magic. 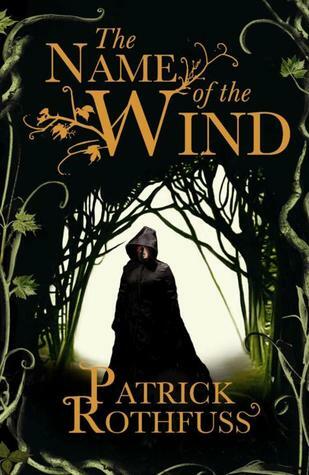 The size of The Name of the Wind may seem intimidating, but believe me – you won’t want it to end! I have the sequel,The Wise Man’s Fear, in my room but I’ll have to wait a while before I start it or I will never get anything done for my university classes. Also, it will make the wait for book 3 shorter. Have you read The Name of the Wind? What did you think? Are you also anxious for book three? I love, love, love he sound of this book. First time I've heard of it and I'm eager to get started. Added it to my TBR list and thanks for getting it under my radar. Loved the review. I really envy you Americans for all the awesome events there are over there! Honestly though, the amount of times the word 'that' can sneak into a story is astounding! It's definitely better to go and delete them. But his manuscripts are so huge it must've taken forever. "Like" us at www.facebook.com/eoliantavern! Help spread the Kingkiller Chronicle love!